Are you ready to launch an exciting, rewarding Professional Organizing Business? Skip the years it takes to come up with the successful systems and tools by taking this comprehensive Self Study Course. Clear & SIMPLE has been training organizers for 10+ years and we can give you everything you need to succeed. Come join the Clear & SIMPLE Circle of Organizers around the world! ** Please note that shipping and handling fees are additional and billed separately through PayPal. See below for more. 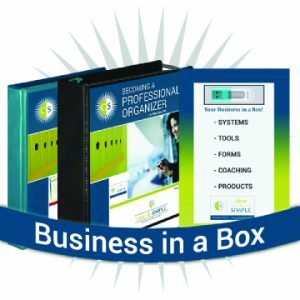 Are you ready to launch an exciting, rewarding Professional Organizing Business? Skip the years it takes to come up with the successful systems and tools by taking this comprehensive Self Study Course. Clear & SIMPLE has been training organizers for 12+ years and we can give you everything you need to succeed. Come join the Clear & SIMPLE Circle of Organizers around the world! ** Please note that before we ship your course you will need to sign Our Copyright Agreement. Also, shipping and handling is an additional cost, billed separately through PayPal. Within the U.S. $35. We DO ship internationally, please contact us at [email protected] for more information.